This flavor variation from the Orange Julius company may be called Banana Julius, but they also add a little orange juice to the mix. Make sure your bananas are ripe for this clone, so you get a nice sweet drink with the perfect thickness. 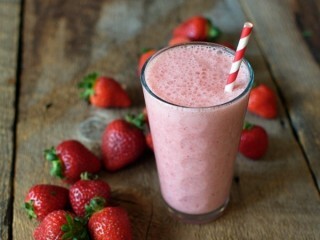 As the trend for fruit smoothies surged in the 1990s, the Orange Julius company didn't want to be left out. 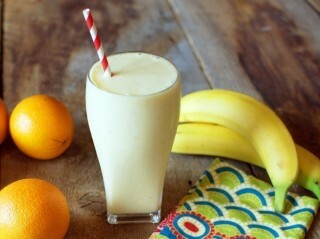 Orange Julius popularized the fruit smoothie with the original Orange Julius blended drink back in 1926. 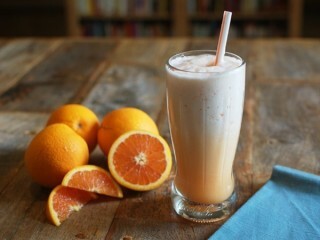 But as thicker smoothie drinks of more complex blends became popular, Orange Julius put a twist on fruity beverages with a secret ingredient that is dumped into the blender along with the fruit. They also add a scoop of the original powdery compound added to the "Julius" drinks. This new powder, called coconut-almond compound, includes a frothing and thickening agent, plus a hint of coconut and almond flavorings. 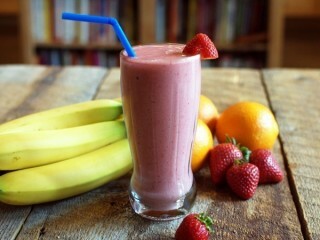 Now you can clone your own version of the most popular variety of the chain's Classic Smoothie using coconut syrup and almond extract as part of your own homemade secret recipe.